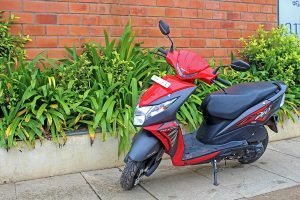 We got a chance to review the all new Honda Dio 2017 version that is compliant with new regulations by Government of India like Automatic Headlight ON (AHO) and BS4 compliant engine. 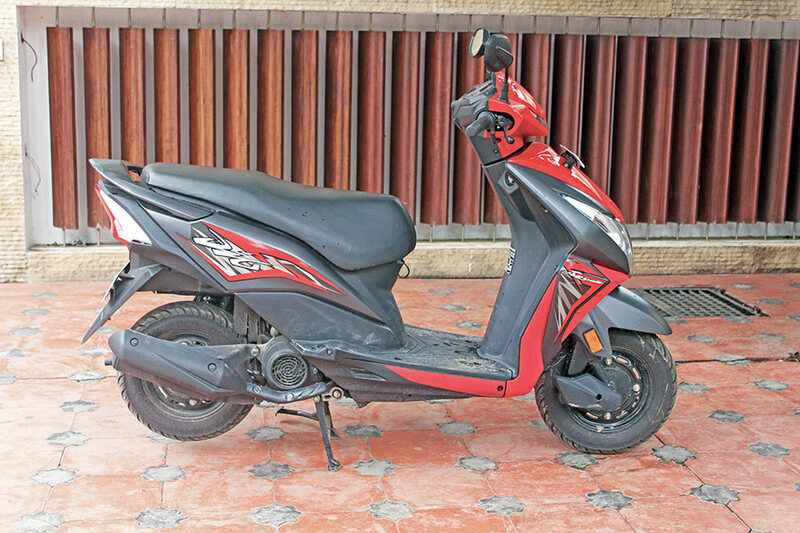 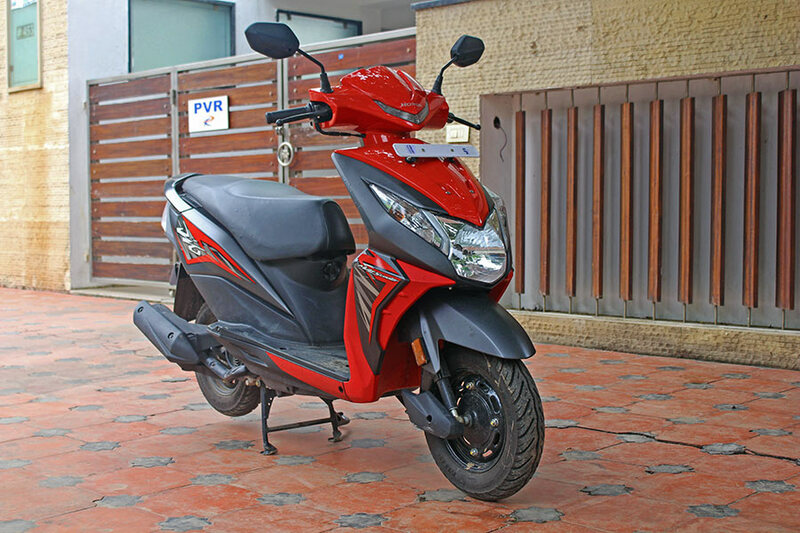 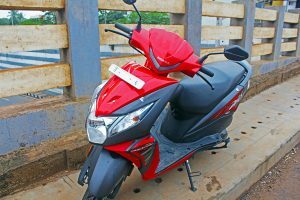 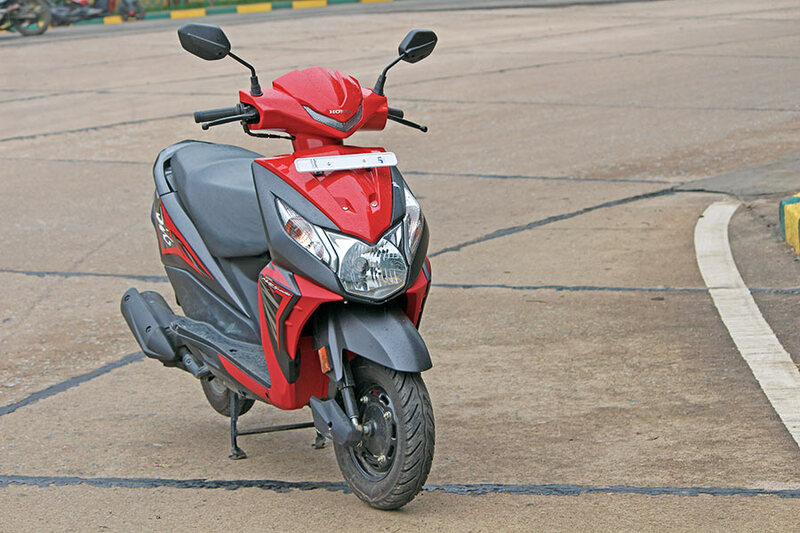 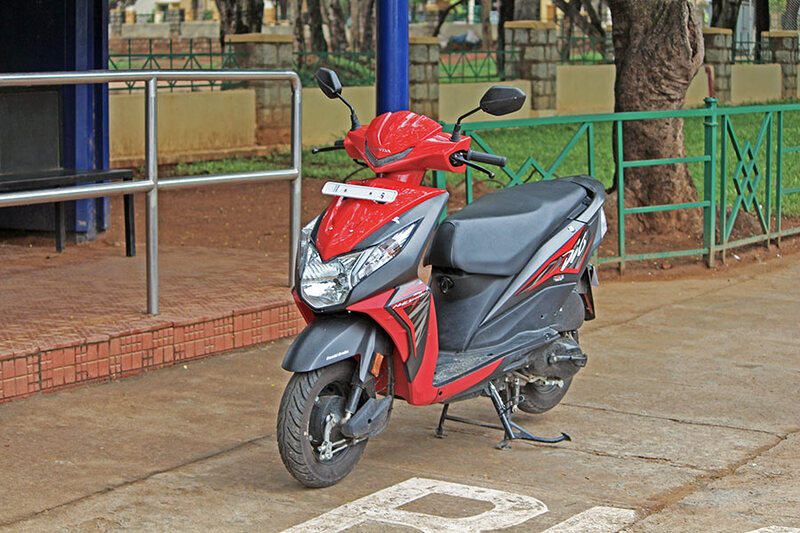 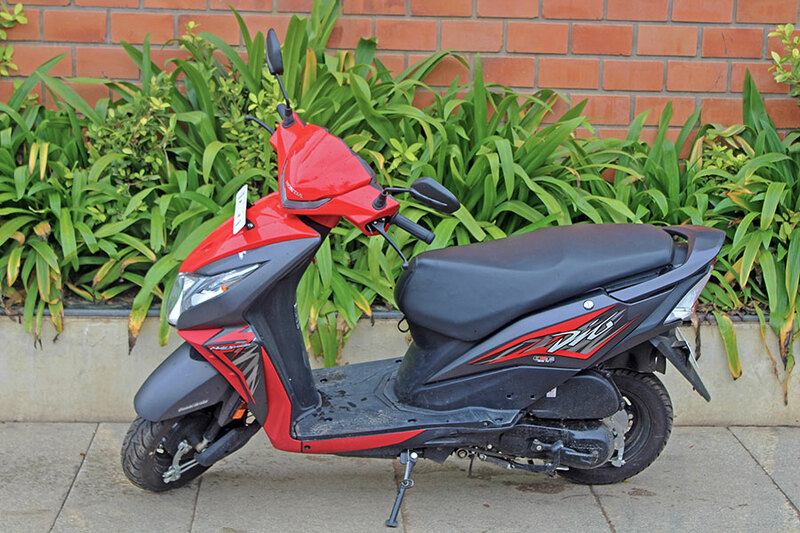 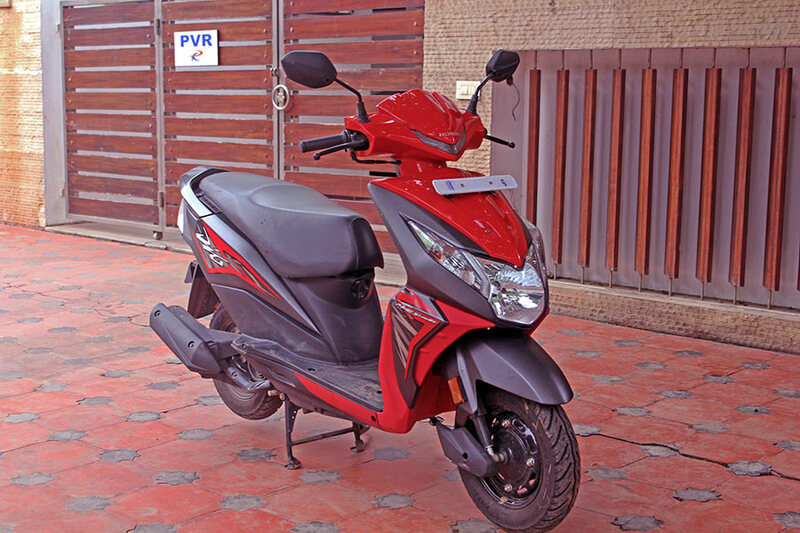 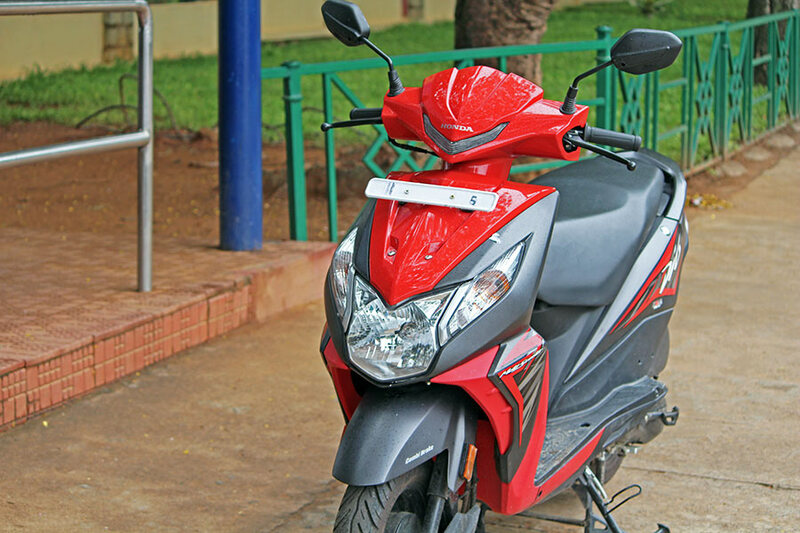 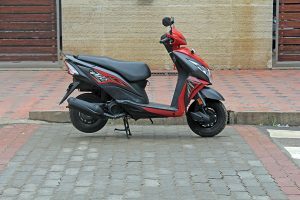 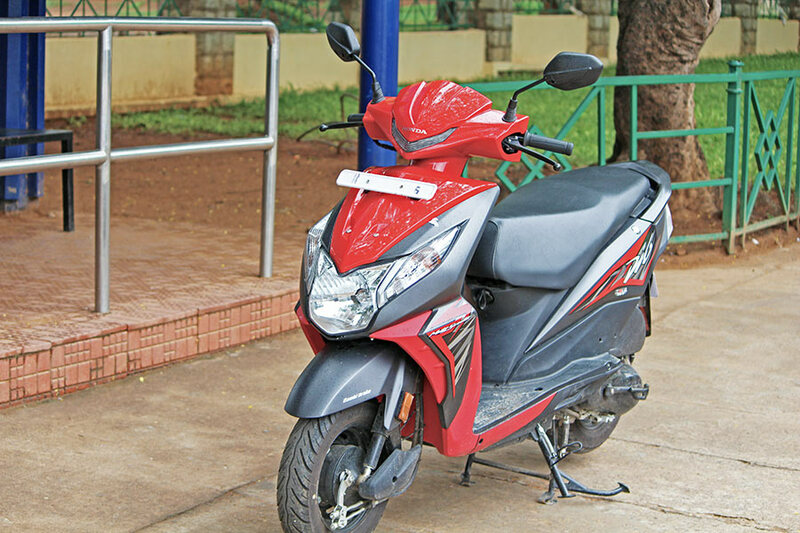 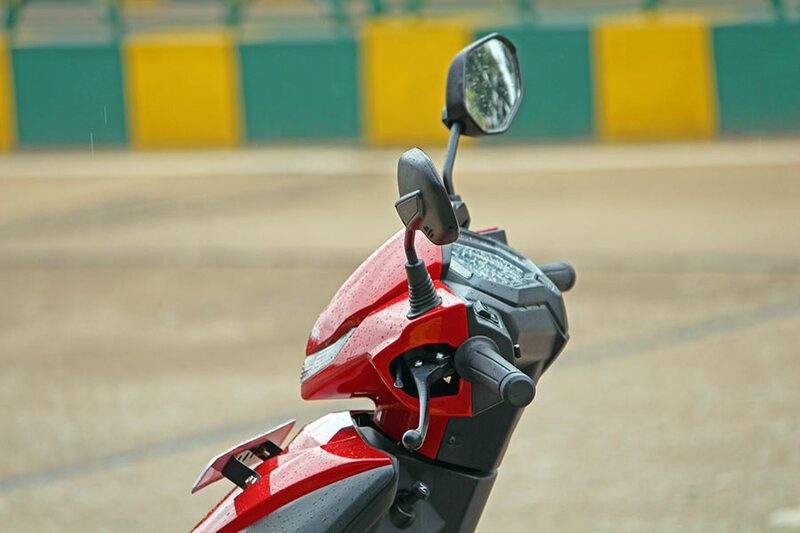 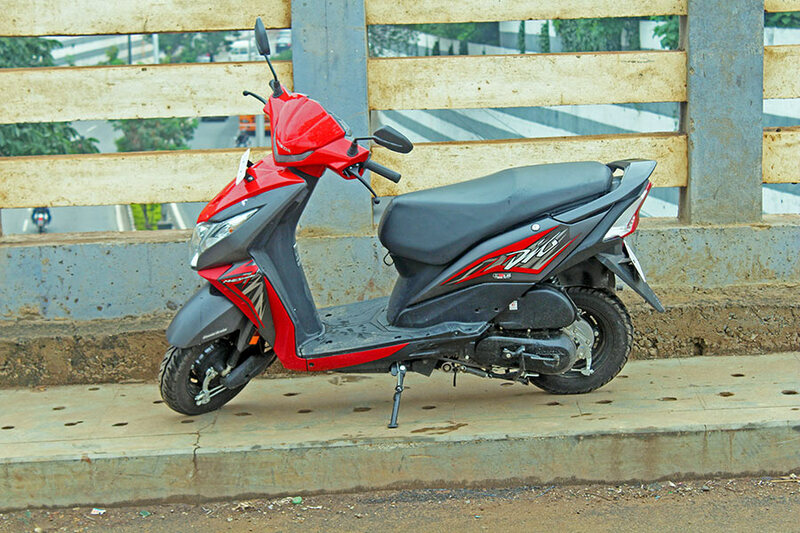 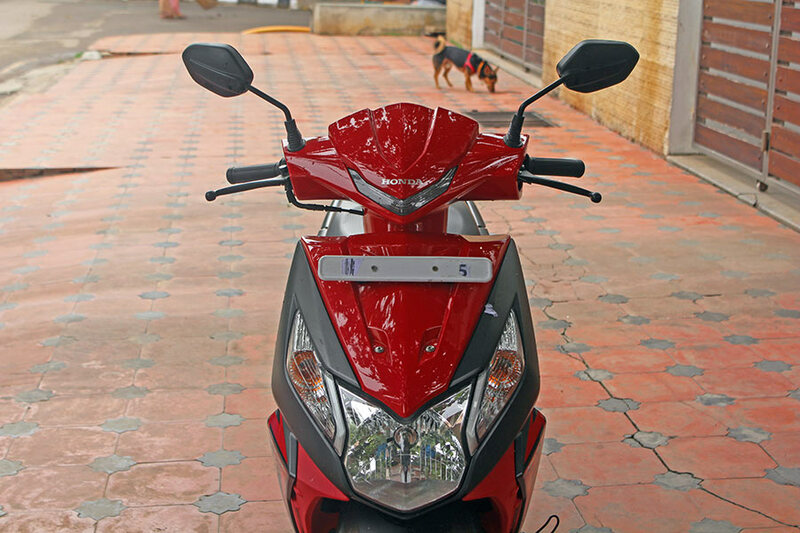 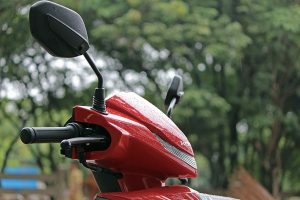 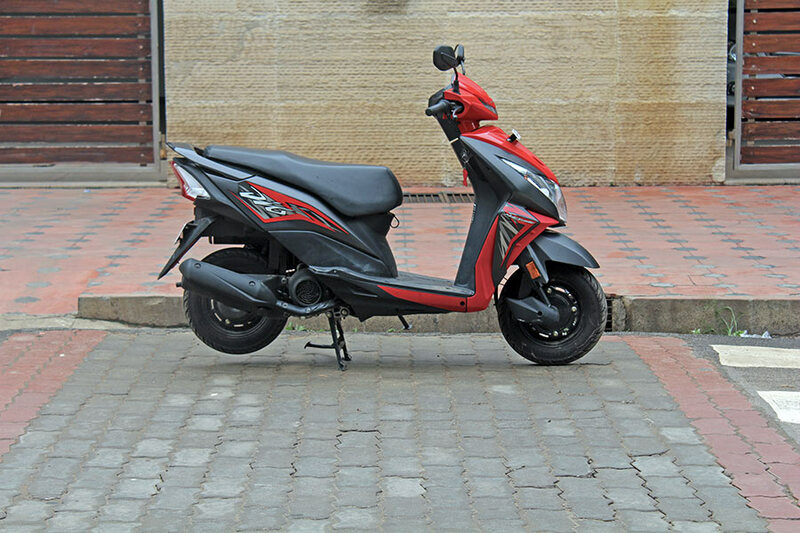 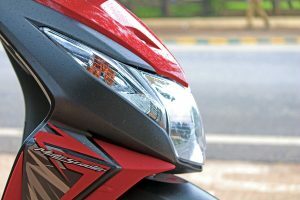 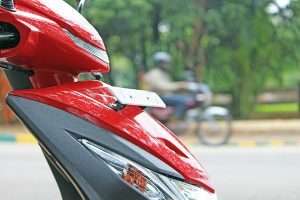 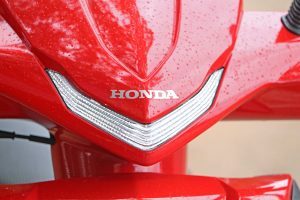 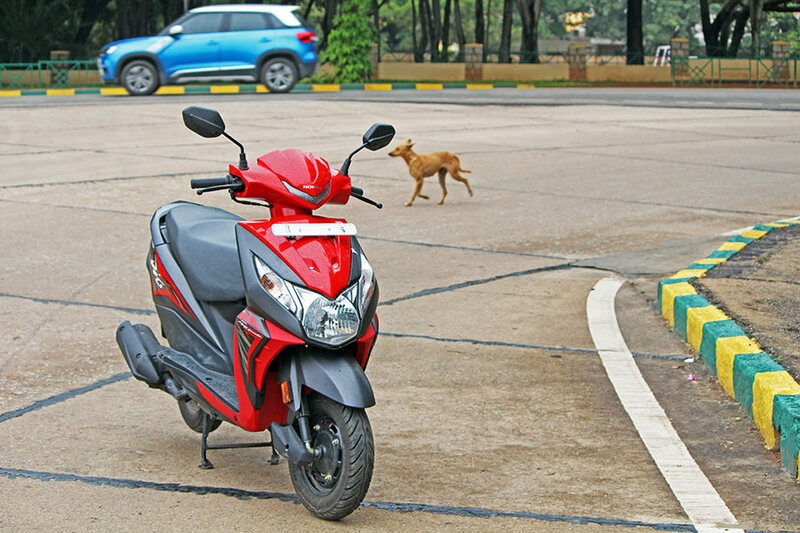 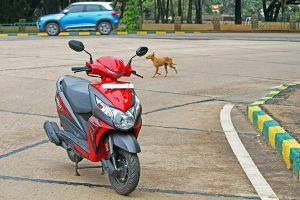 All the Honda Dio scooters which are available in the market are now made available in dual-tone color combination the one which we picked for the review is Honda Dio in Sports Red color variant. 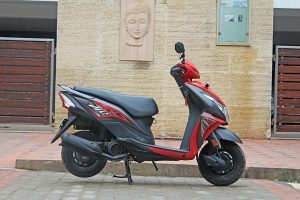 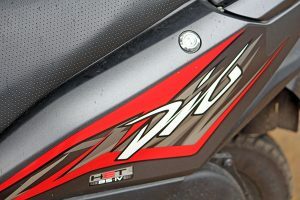 What follows is the review of all new 2017 Honda Dio which was provided by Honda Dealership in Bangalore – Dhruvdesh Honda. The all new 2017 Honda Dio follows the one-piece design philosophy – meaning – All the components are well-integrated to the scooter and doesn’t look like something extra has been fitted. 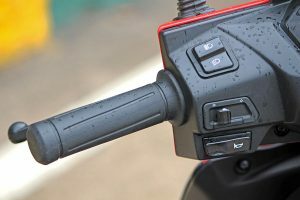 Be it the appropriately placed turning indicators in the front dashboard, rider foot pegs for the pillion are all embedded in one piece and goes with design. 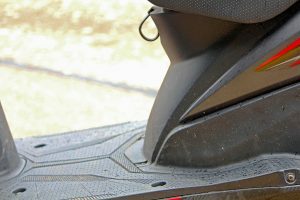 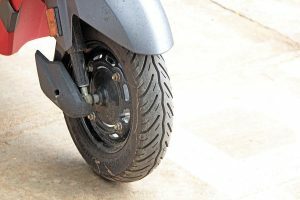 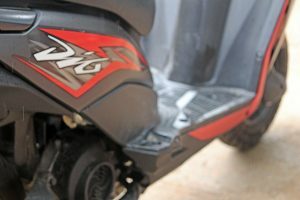 When we reviewed the Zest 100 scooter from TVS Motors‘, we had this issue of rear foot pegs getting auto-folded accidentally. The front design along with illuminated fog lamps is a treat to watch. 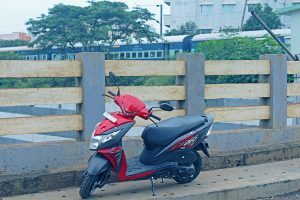 No wonder, the design is categorically copied by other scooter manufacturers in India. Also the new dual tone colors Sports Red in combination with the Black paint grabs attention. 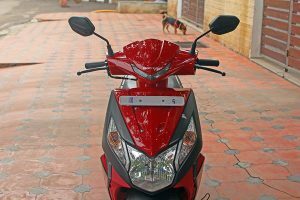 The all new BS4, AHO compliant 2017 Honda Dio gets 109.19cc fan cooled, 4 stroke, SL BS-4 engine. 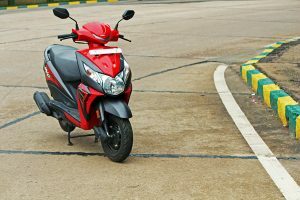 Honda Dio’s engine churns out maximum power of 5.83 kW (8 bhp) at 7000 rpm and delivers maximum output of 8.91 Nm at 5500 rpm. 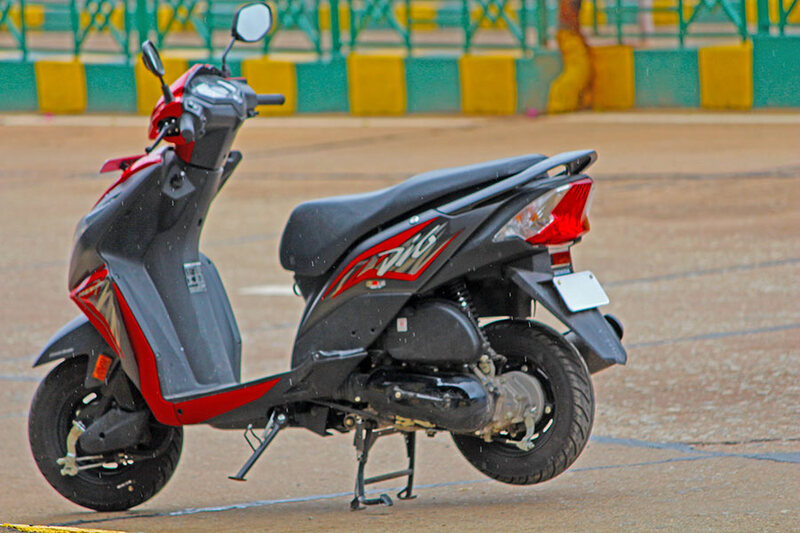 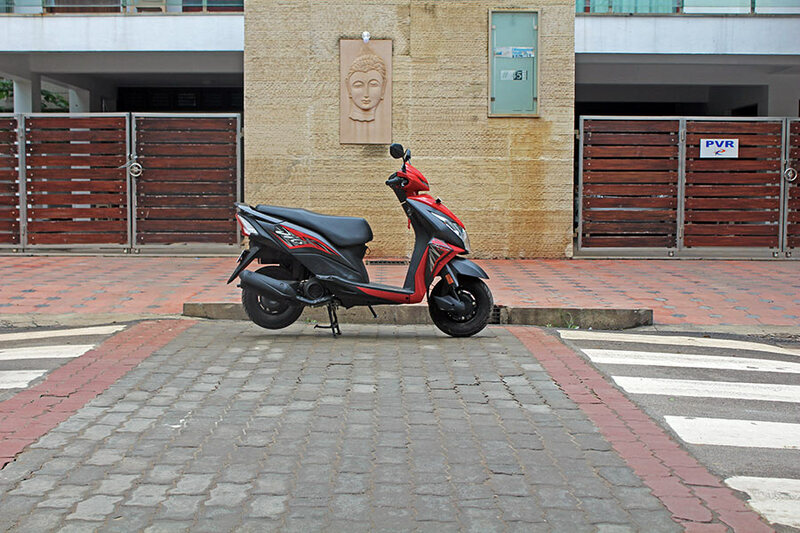 The 110cc engine of Honda Dio is mated to automatic gearbox – the scooter is equipped with both kick start and self start. 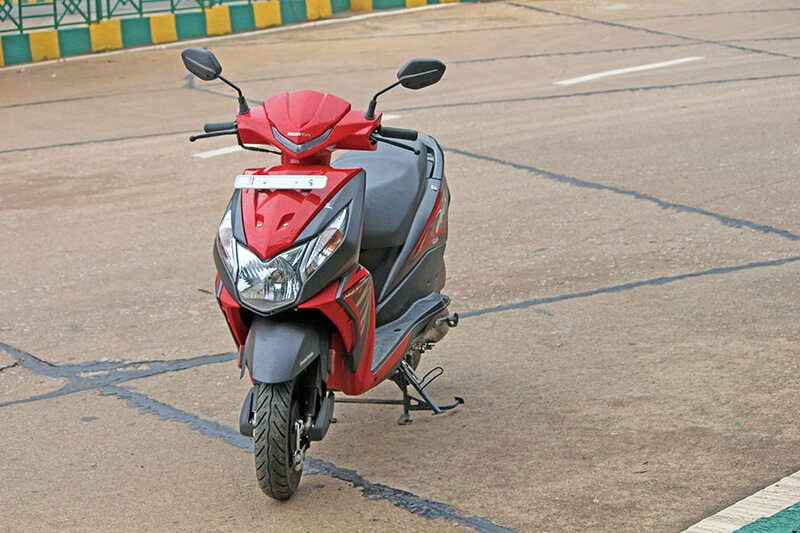 Honda Dio is powered by CBS (Combi-braking System) with equalizer that helps in reducing the braking distance. Both front and the rear tyres gets the 130mm Drum brakes. 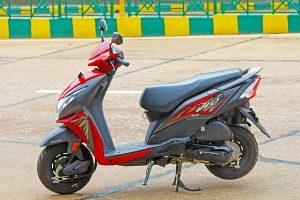 The all new 2017 Honda Dio measures 1781mm in length, 710mm in width, 1133mm in height and has a wheelbase distance of 1238mm. The seat height of 2017 Honda Dio is 765mm which makes it suitable even for the short riders. 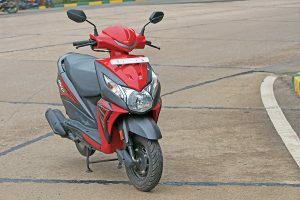 The latest Dio weighs 103 Kgs (Kerb weight) and has a fuel tank capacity of 5.3 Litres. 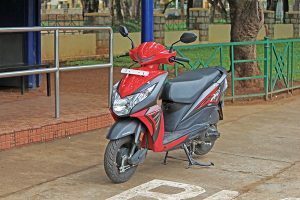 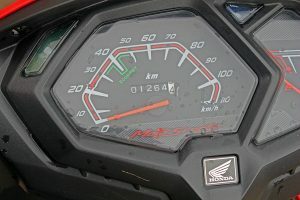 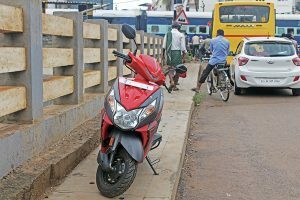 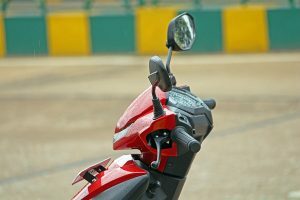 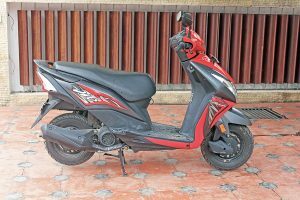 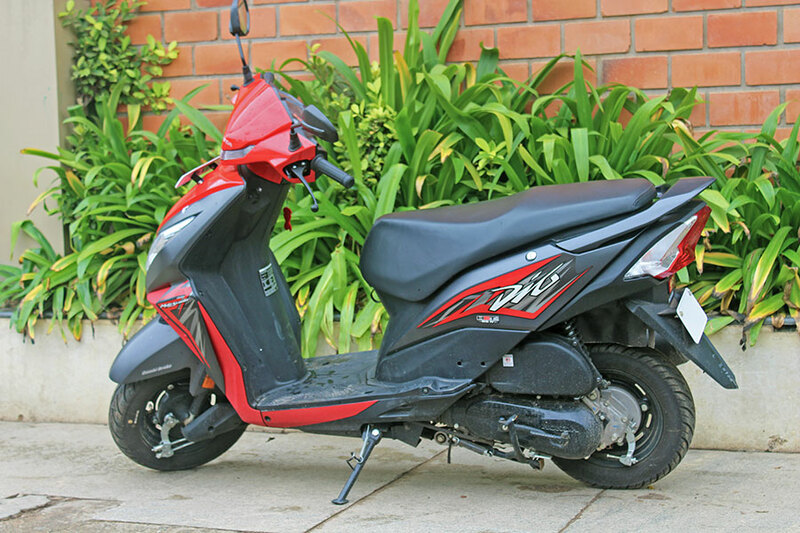 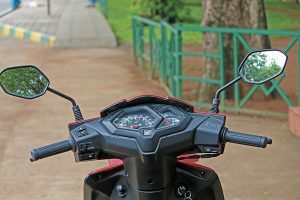 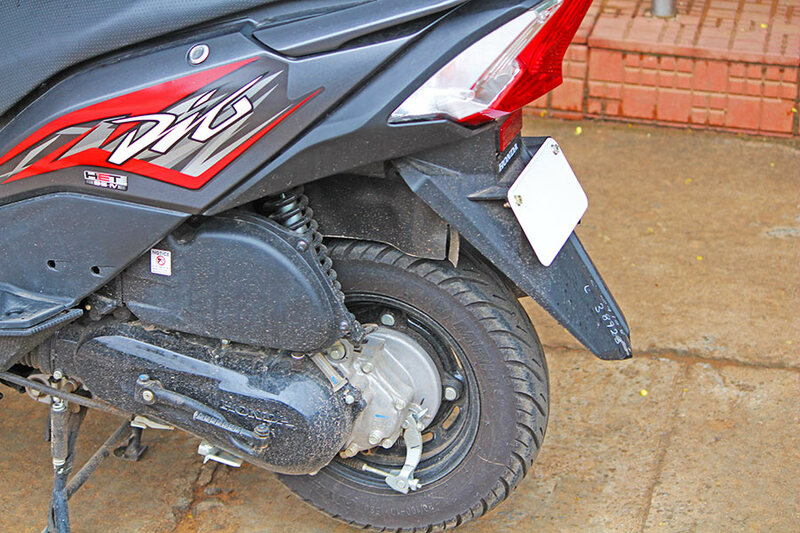 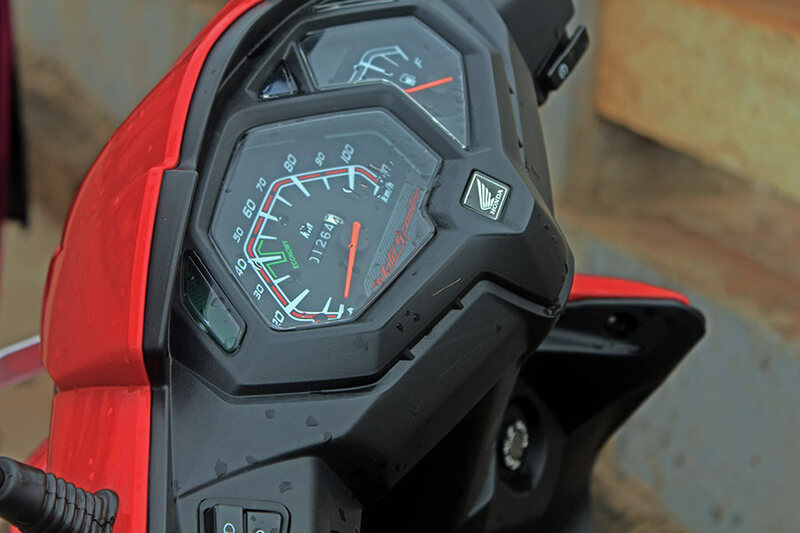 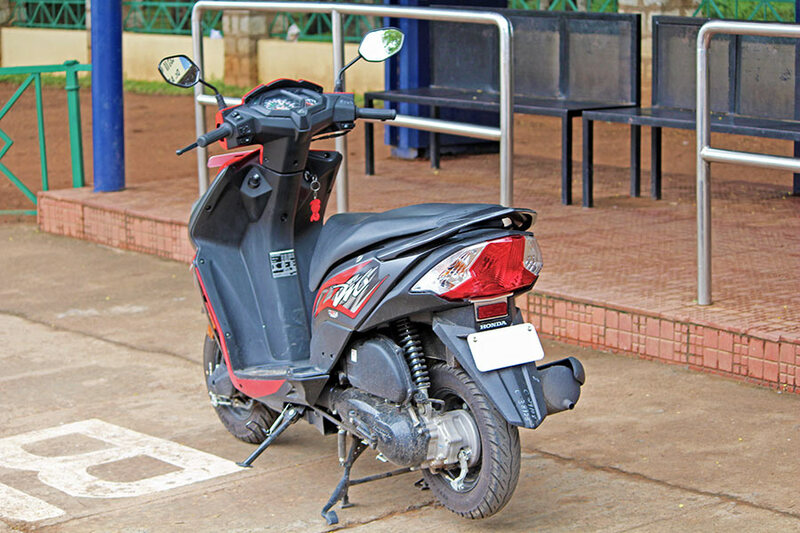 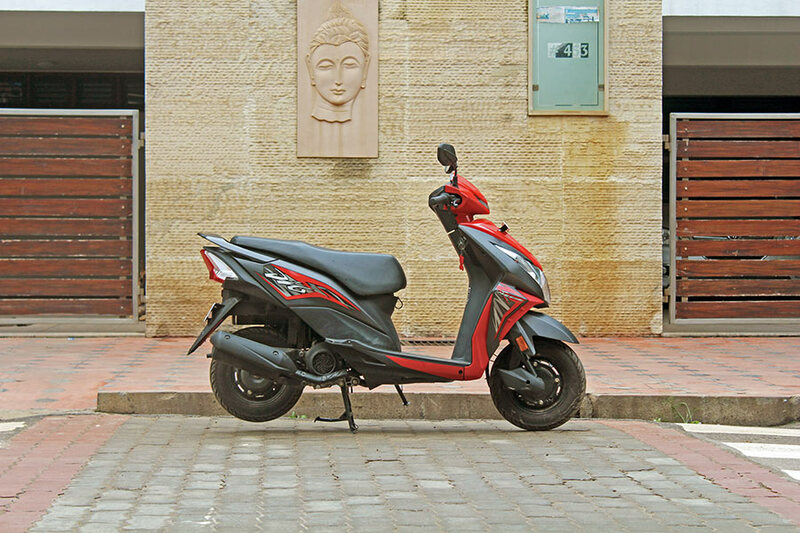 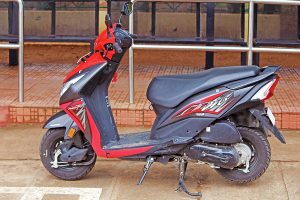 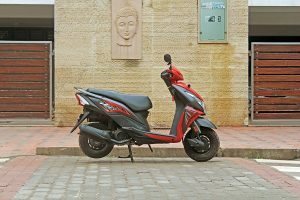 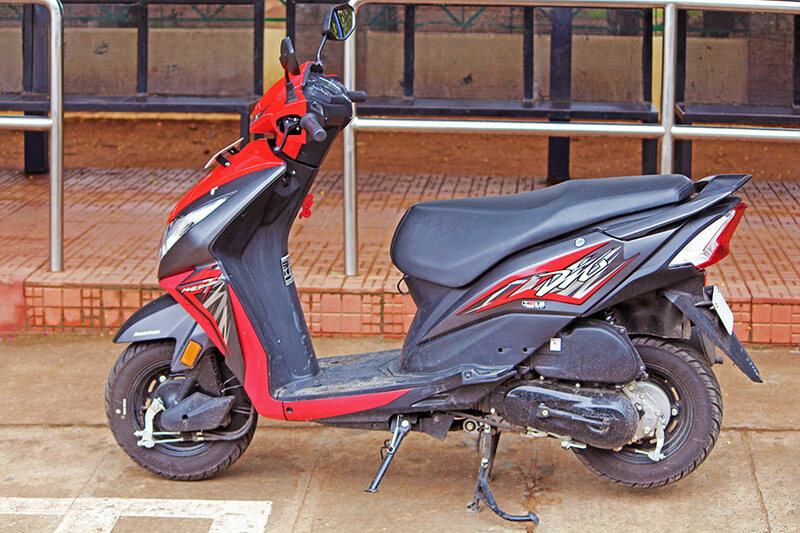 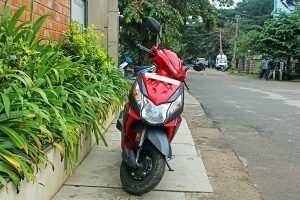 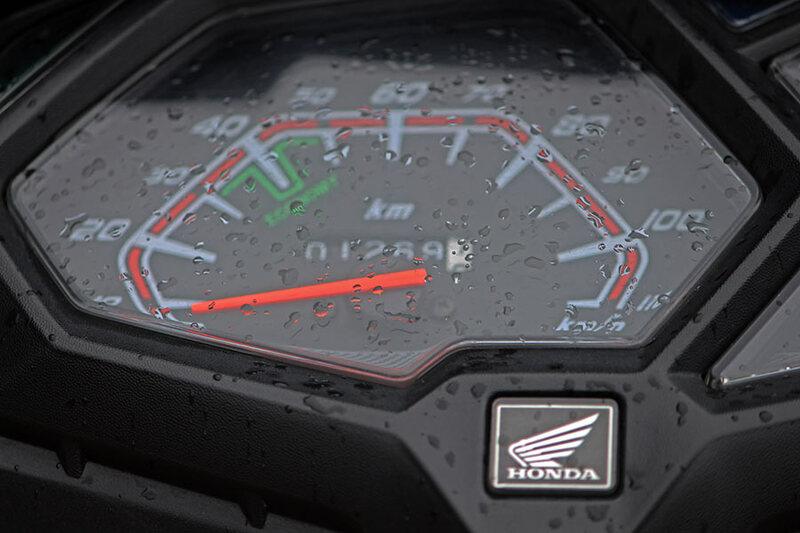 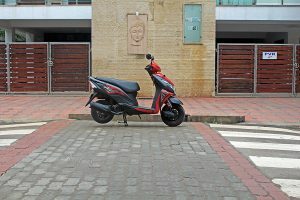 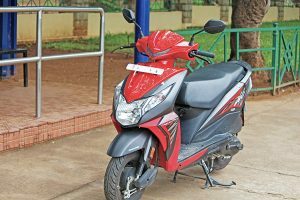 The mileage offered by 2017 Honda Dio in city conditions is around 45 Kmpl, the mileage of 2017 Dio varies depending on the speed at which the scooter is driven and the terrain conditions. When it comes to performance – The 110cc engine of Dio, is highly stable and consistent. 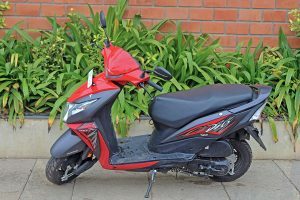 You can hear the sweet sound of this motor-scooter as you throttle. 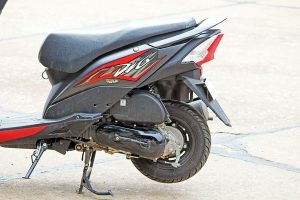 The bike’s 8 bhp of power and torque of 8.91Nm delivered by 110cc engine is fair enough to climb the steep and tough terrain with enough Balance. 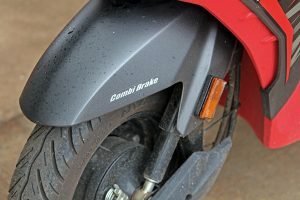 Thanks to the advanced braking system CBS (Combined Braking System) that is very responsive and reduces the braking distance. 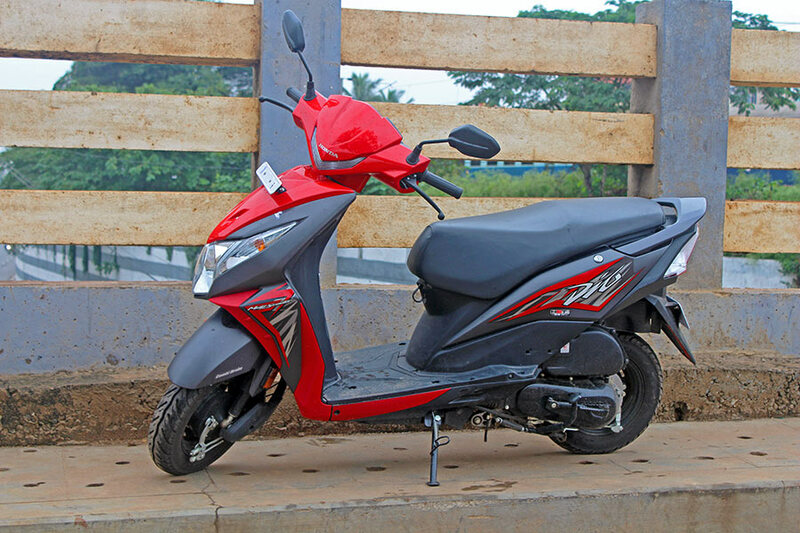 The 2017 Dio gets wide and super comfort seat which is ideal for you and your partner in the back to enjoy a short distance road trips. 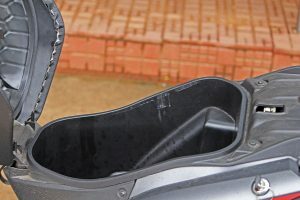 You also get the grab rails at the bags which can be made use of for the greater stability. 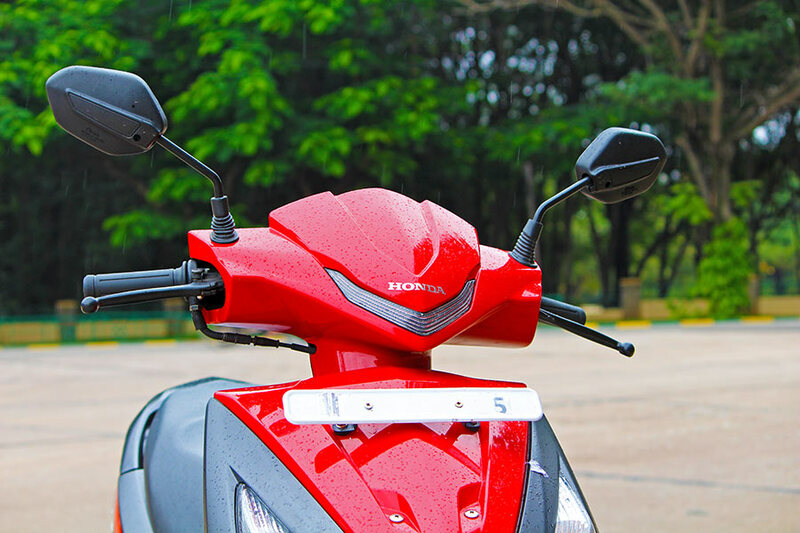 The all new 2017 version of Honda Dio gets Mobile charging Socket under the seat which is very useful for charging your smartphones through USB ports. 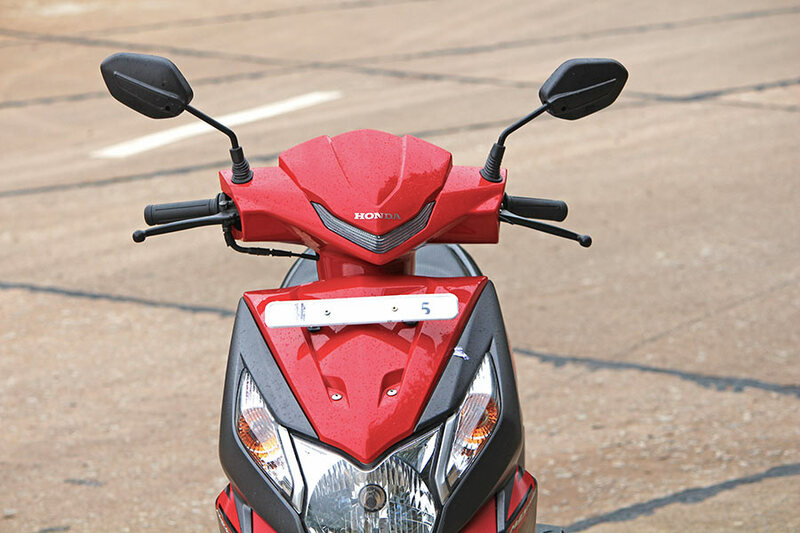 The 2017 Honda Dio has a 18L underseat storage space to keep all your important stuff like Helmet, handbags, books etc etc. You also use the hook in the front that can be used to hang your carry bag. 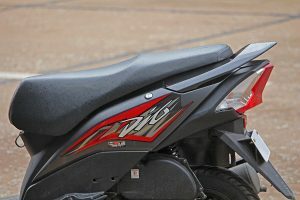 While we already talked about the Dio getting brand new dual-tone colors, the stand out “Moto-Scooter” design gives the stylish look. 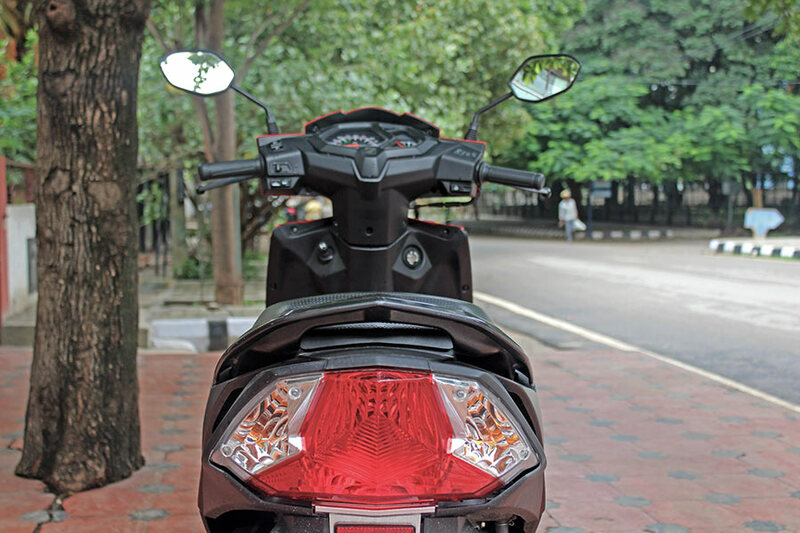 The bold body mounted headlamp and trendy instrument with edgy speedometer design makes it a rock-star on the road. The all new 2017 Honda Dio is priced at INR 51,306 (Ex-showroom Bangalore). We think its a great gearless bike, especially for the youth. 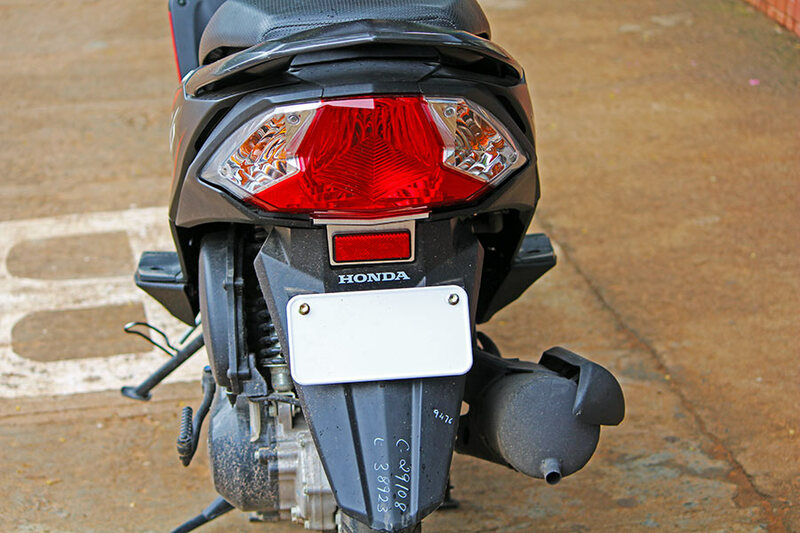 We would like to call Honda Dio as a beautifully done Single Master Piece because of how it looks and the way the design elements (Like front headlamps, LED Fog lamps) has been mounted. With a price tag less than that of Honda Activa 4G, the all new 2017 Dio Gives less for more! What is our take on 2017 Honda Dio? 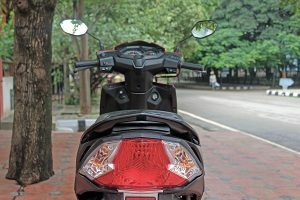 Do drop your comments in the roads forum. 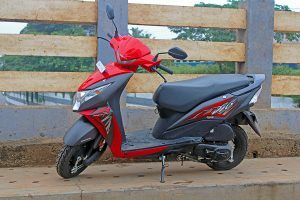 For all photos of 2017 Honda Dio check the photo gallery.